Atlantis Duran is the daughter of Diana M. Duran and Andrew R. Carrillo. She was born and raised in Santa Fe, NM and graduated from the Santa Fe Community College in 2009 with high honors receiving her Associate’s degree in Paralegal Studies. She worked in private law firms for eight years before joining the State of New Mexico, where she currently works for the Office of the State Engineer/ISC as the paralegal to the General Counsel. She credits her faith in God and unconditional support from her family that helped her to overcome the diagnosis of pancreatic cancer at the age of seventeen. Since then she has been diagnosed with a brain tumor, which she underwent emergency brain surgery. She is currently battling advance renal kidney cancer. She praises her late grandmother Viola R. Duran and her aunt Roberta Duran Perea for always encouraging her and never letting her illness stop her from achieving her goals. She is hoping by running for La Reina de Santa Fe she will help to encourage other younger girls facing difficult challenges in their life to have faith in God and themselves. Atlantis is sponsored by Los Caballeros de Vargas. Question: Based on your knowledge, what is the most significant aspect of Fiesta de Santa Fe? I believe the most significant aspect of the Fiesta de Santa Fe is the beautiful story behind it. Don Diego de Vargas prayed to La Conquistador that if he was able to peacefully reoccupy, Santa Fe, that he would honor her every year. For over 300 years the city of Santa Fe has kept his promise. Each year we celebrate the power of that prayer and the faith he had in La Conquistador. It is a time for celebration, to remember and honor our beautiful lady. Let his story remind us to have faith not only in our self but to also have faith in the power of prayers. Over the years, the true meaning of the Fiesta de Santa Fe, might have been forgotten or overlooked but when I see the beautiful statue of La Conquistador, I am reminded of the courage, love and faith that Governor Vargas had that fateful day when he gazed upon our lady and humbly prayed to her for guidance and protection. Angélica is sponsored by State Employees Credit Union, age 25, daughter of Phillip Padilla and Mary Martinez-Padilla. She is a graduate of St. Michael’s High School class of 2009. 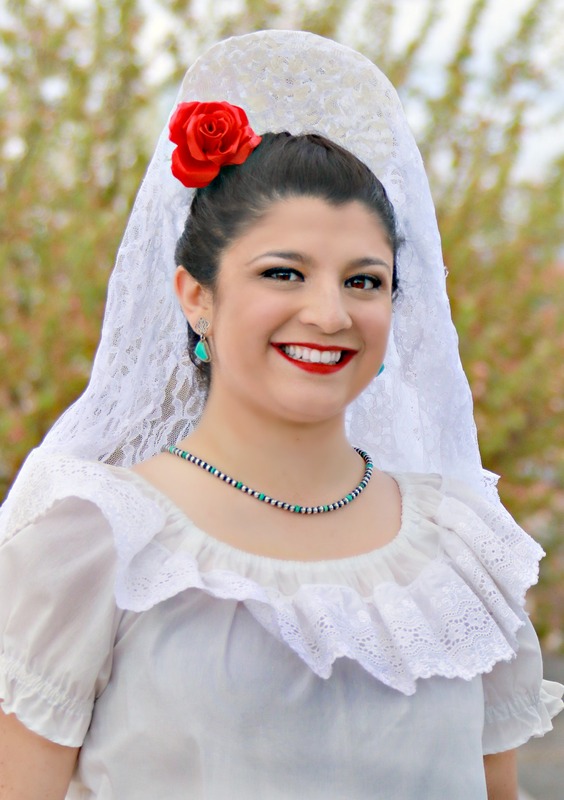 Angélica obtained a double major in Chemistry and Spanish from the University of New Mexico in 2014. She was a volunteer English teacher in the southern region of Chile for a semester in 2015. Currently she is teaching Spanish GED classes while obtaining a teaching license. Starting this Fall semester, she will return to UNM to get a Master’s degree in Spanish with a concentration in Southwestern Hispanic Literature. Question: As you know the Santa Fe Fiesta has many events, what is your favorite event at Fiesta and why? Mi evento favorito de la Fiesta de Santa Fe es la procesión con Nuestra Señora La Conquistadora desde La Catedral hasta La Capilla de Rosario, porque es una de las razones principales por la que celebramos La Fiesta- para cumplir con la promesa que hizo Don Diego de Vargas. I believe this is a sacred procession for Our Lady, as well, because she gets the opportunity to journey amongst her beloved Santa Feans through our city streets while listening to our songs and prayers. She also gets to return to the location she protected outside of Santa Fe during the resettlement. Brittany Ana Maria Sandoval y Romero, 25, is the daughter of Miguel and Anna Jorene Sandoval. She is a 2008 graduate of St. Michael’s High School and a 2014 graduate of New Mexico State University where she earned a Bachelor of Science in Early Childhood Education with a minor in Dance. Brittany is currently a Pre-Kindergarten Teacher at Nina Otero Community School and a fitness instructor at locally owned, Uplifted Fitness. She is proudly sponsored by La Sociedad Folklórica. Question: What are you doing to preserve Santa Fe Fiesta? I am currently a Pre-Kindergarten Teacher at Nina Otero Community School and I am preserving La Fiesta de Santa Fe by teaching the young children in my classroom about our beautiful city’s culture and traditions. 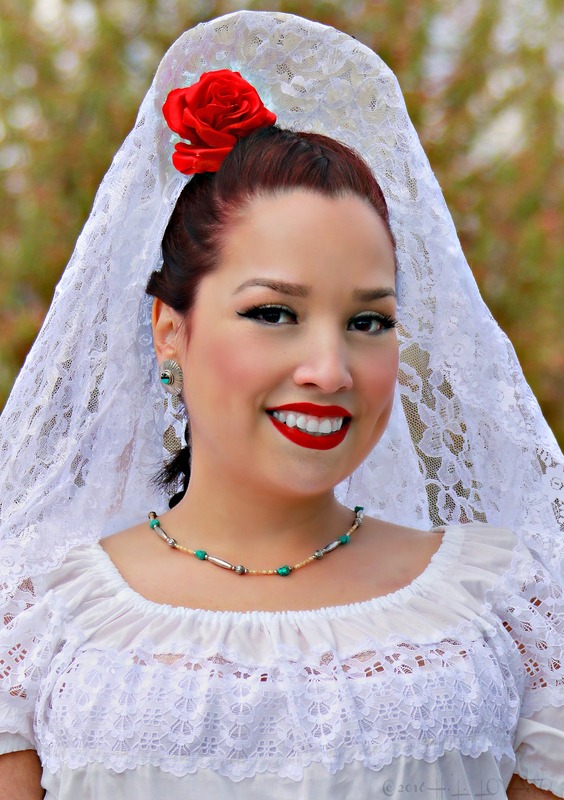 I am also an aunt of 8 and I encourage my nieces and nephews to attend the annual Novena Masses in honor of our Blessed Mother, Nuestra Senora, La Conquistadora; I also remind them of the most important aspects of La Fiesta de Santa Fe, continuing to have vespers, masses, sermons and processions in honor of the promise that Don Diego DeVargas made 324 years ago. As a child, I participated in many events including attending Novena Masses, and participating in the Exhibición de Modas y Merienda, as well as the Defile de la Gente with La Sociedad Folklórica and my grandmother. 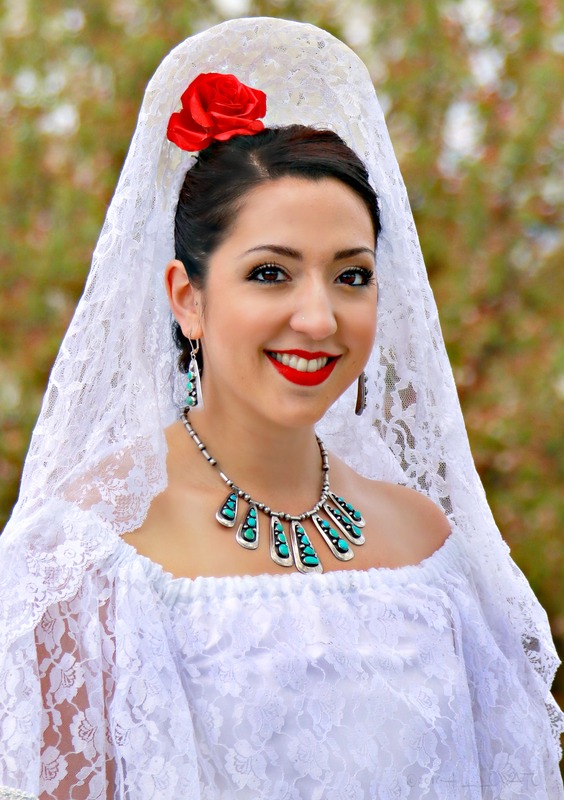 Now that I am a young woman, I still continue to attend the annual Novena masses and my candidacy for portraying the role of La Reina de La Fiesta de Santa Fe will allow me to be a greater part of preserving our city’s culture, faith, and traditions.